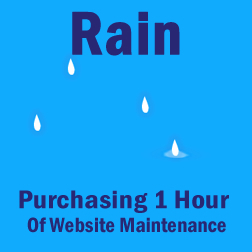 The Rain Maintenance Package which is our hourly plan works for potential clients who want to test the waters first. By purchasing an hour enables your company to benefit from Webvisuals decades of experience brought to focus on your website. See how your website begins to steadily improve with our services. Alot of times what you are looking to have done with your website may take only a couple of hours to fix or design. For established clients who have a couple of tasks that they want done to improve their website. Add a couple more hours and get more done on your website. We've working with you before and know how your website is setup to we can efficiently work on your site having worked on it previously. We track our work in 15 minute intervals of time for efficient output. Thats why there is 4 rain drops in the graphic. 60 minutes in an hour, that makes 4 time intervals we could be working on your website. That 1 hour could last for weeks depending on how complicated the tasks are. Want more done with low committment, add a few more hours by increasing the quantity of hours. We offer affordable website maintenance pricing for organizations and businesses of any size. We have built a custom site design (CSD) system that creates efficiencies that allow us to complete work in 15 minutes that would have taken hours a few years ago. To fulfill your request our web developer/designer use 15 minute time intervals dedicated to your needs. Simply fill out our online request form or email us your changes. Once completed, we will send you notification to review our work. With your confirmation we mark the tasks off as complete. We've been doing this for a long time. We are always striving to improve our craft and the quest to build the perfect website. Online Ticket System - Easy submission of requests via direct email to Webvisuals. Time Tracking - Webvisuals has a proprietary time accounting system that tracks all details of activities on your account. A report is available at any time upon request.